The Foxwoods Resort Casino in Mashantucket, Connecticut was the host site for tonight’s World Championship Boxing telecast on Showtime. 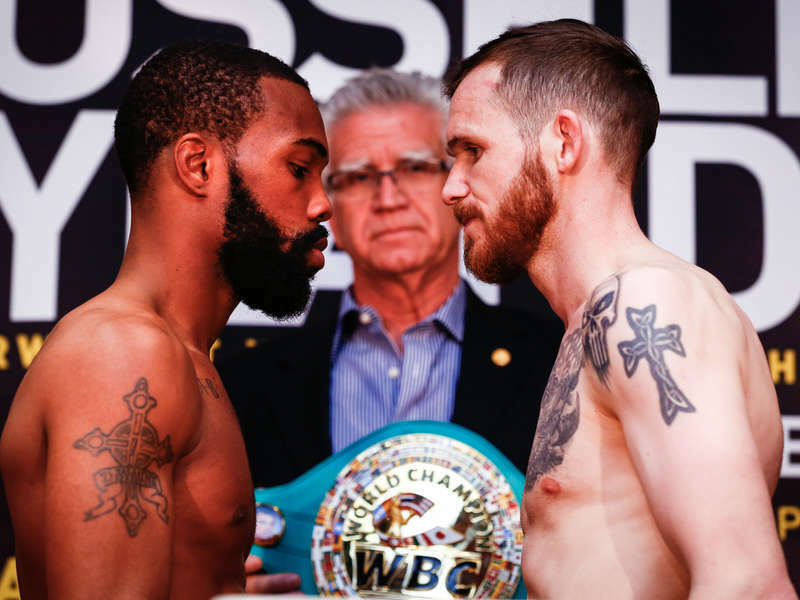 Two world title fights were featured as Gary Russell Jr. defended his WBC Featherweight Title against Patrick Hyland in the main event of the night and Jose Pedraza defended his IBF Junior Lightweight Title in the co-main event. The first bout of the night was between Jose Pedraza (21-0) and Stephen Smith (23-1) for the IBF Junior Lightweight Title. Smith started the bout off strong by taking control of the center of the ring in the first round and was accurate with his lead left hook, but neither boxer was threatened in the opening stanza and both were feeling each other out. Pedraza came out firing in the second round and landed an early two punch combination followed by a straight right hand that hurt Smith. Smith was forced to tie up several times in the second round as Pedraza was able to land several hard shots. Pedraza showed good head movement in the third and fourth round and boxed patiently. Smith was able to land a few blows to the body of Pedraza, but Pedraza remained in control. Pedraza’s upper body movement appeared to confuse Smith in the fifth and sixth rounds, and Pedraza pressed forward more in the sixth round and was effective in landing from the outside. Smith was able to offer some good flurries in the seventh and eighth rounds and may have stolen these rounds, but his shots were not hurting his opponent. Pedraza finally scored a knockdown in the ninth round when he connected with a flush counter right hand. Smith was able to get back to his feet and held on when he could to try and survive the round, but not without taking some additional punishment. Smith showed heart and clearly needed a knockout in the championship rounds to win the bout, but he was unable to do so. The judges scored the bout 117-110, 116-111, and 116-111 for Jose Pedraza. The main event of the evening was between Gary Russell Jr. (26-1) and Patrick Hyland (31-1) for the WBC Featherweight Title. 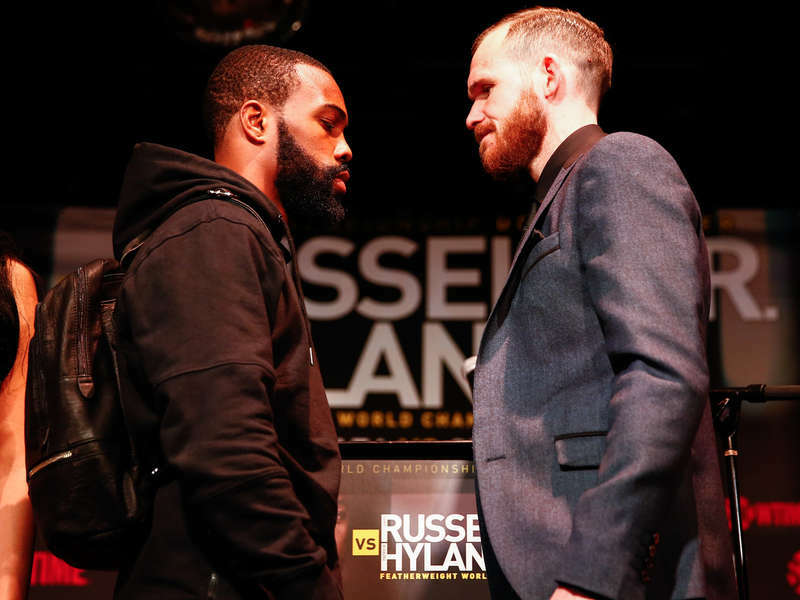 Patrick Hyland was a heavy underdog in this fight, and Russell’s hand speed was very evident in the first round as his jab was on point and he seemed confident in landing his combinations when he threw them. Russell was able to score his first knockdown in the second round with a lightning fast right hook that sent Hyland to the mat for the first time in his career. He was able to get back to his feet but was knocked down a second time while falling back into the ropes. The referee allowed him to continue, but he only went down for the third and final time after a four punch combination for Gary Russell Jr. The referee, rightly, waived off the fight. Gary Russell Jr. won by KO at 1:33 of round two. On Saturday night the Foxwoods Resort Casino will televised two world title fights live on Showtime as Gary Russell Jr. defends his WBC Featherweight Title against Patrick Hyland in the main event of the evening and Jose Pedraza defends his IBF Junior Lightweight Title against Stephen Smith. Other noted boxers will appear on the undercard including Antonio Russell in the bantamweight division as well as former light heavyweight champion Chad Dawson facing Cornelius White. Only two fights are currently scheduled to be televised on Showtime, but highlights of the undercard may be shown. The following is a preview of both the televised championship fights. Jose “The Sniper” Pedraza had some considerable hype when he turned a professional for he represented Puerto Rico in the 2008 Summer Olympics and medaled in several international events. He is the current IBF Junior Lightweight title holder and has a significant edge in amateur experience over his opponent Stephen Smith, despite the fact Smith won the gold medal in the 2006 Commonwealth Games as an amateur. Neither boxer is known for their power, as Pedraza has twelve knockouts on his record while Smith has thirteen. Pedraza is four years younger than Smith at twenty six years old. He will also have about a two inch height advantage as well as a four and a half inch reach advantage. Smith has never fought outside of the United Kingdom and Saturday will be his first fight in the United States. Smith’s resume is lacking in big name victories, and his biggest wins to date were over Devis Boschiero, Mauricio Munoz, and Gary Buckland. Smith’s lone loss was by TKO to Lee Selby back in 2011. Pedraza’s last victory was against Edner Cherry which he won by split decision. Other notable victories include Andrey Klimov, Michael Farenas, and Sergio Reyes. This is a bout that Pedraza should win, quite easily. However, Pedraza has shown that he may have difficulty against crafty veterans as was evident in his bout against Edner Cherry. Unfortunately for Smith, he does not appear to have the power to catch Pedraza by surprise and he was stopped the last time he faced a big name opponent. Gary Russell Jr. has a reputation for fighting boxers that are way overmatched, and Saturday night appears to be another fight that he should win easily. Patrick Hyland is one half of the Hyland brothers and is more famous for his previous management deal with Snooki of MTV’s the Real World than for his actual boxing ability. Patrick was the better of the two Hyland brothers, but it appears he no longer has a working relationship with Snooki. Both Hyland and Russell have fifteen knockouts on their resume. Hyland will have a significant height advantage as he is three and a half inches taller than Russell. Russell, however, is five years younger than Hyland. Russell also holds an edge over Hyland in amateur experience. Russell qualified for the United States in the 2008 Olympics but failed to compete due to missing weight. Despite the fact Russell has a reputation for fighting inferior opponents, he has a vastly better resume than Hyland. He has defeated the likes of Jhonny Gonzalez, Christopher Martin, Vyacheslav Gusev, and Christopher Perez. His lone loss was the current world champion and amateur standout Vasyl Lomachenko. Russell has two stoppage wins in his past five fights. Hyland’s only notable victories came against Emmanuel Lucero and Frankie Arhculetta. His lone loss was to Javier Fortuna in 2012. Hyland is the type of opponent that Russell should dispatch of easily. Russell does have problems when he’s facing someone that can match him in hand speed as was evident in his bout with Lomachenko, but Hyland will be outmatched in hand speed. This is a bout that Russell should look incredible in, and it’s hard to envision a scenario where Hyland pulls off the upset.